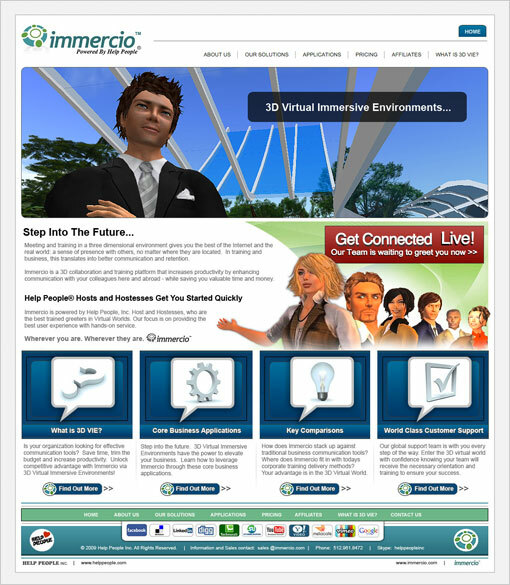 Immercio leads the way in business and training applications for 3D virtual reality. They are best known for their success at Help People® Island in Second Life; introducing 3D Virtual Immersive Environment (VIE) to more than 250,000 individuals. Our client needed a website with an strong online presence that effectively communicated to their target audience: Fortune 500 companies. The requirement was to drive traffic, convert visitors into clients and design a website that facilitated meeting and training in a three dimensional environment. Blog and features for all major social media including Facebook , Twitter, Linkedin, Youtube, etc.